The Resistance! : Boston Tea Party a Success...... Again! Republican presidential hopeful Ron Paul's supporters donated over $6 million Sunday to boost the 10-term Texas congressman's campaign for the White House. 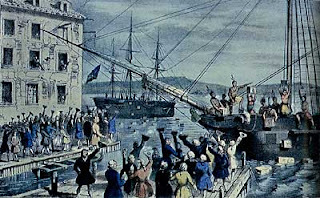 The goal of the Boston Tea Party 2007 was to raise as much money as possible on the Internet in one day on the anniversary of the Boston Tea Party. The campaign's previous fundraiser brought in $4.2 million on November 5th. At midnight EST, donations were over $6 million, according to the campaign Web site. Those donations are processed credit card receipts, said Paul campaign spokesman Jesse Benton. Benton said the median donation is about $50 in the fundraiser, which was the idea of a few Ron Paul supporters who are not officially connected to the campaign. Click Here for Source of this Story.